Far from an impossible task, these eight low-effort, high-reward style hacks for the autumn/winter months prove it’s possible to upgrade your look and still hit the snooze button. You’re welcome. The cooler months aren’t all crisp leaves and pumpkin spice lattes. Coat-ruffling breezes can quickly turn into daggers that rip through your outerwear, and frosty blue skies can switch to monsoon season in a bus journey. So take steps to avoid a commute spent rushing between shop awnings by weatherproofing your wardrobe. Polish doesn’t just get your shoes ready for inspection. Applied regularly, it also provides a sealant that saves you from side-eye, as you squelch around the office in wet socks. Of course, this doesn’t work for sneakers, which require a hydrophobic protector to avoid succumbing to the elements. Your outerwear needs a similar treatment. A quality raincoat gets the green light straight off the peg, but coats made from porous materials like shearling will benefit from a dousing in a spray that locks water out, while leather should be looked after with a balm that also prevents cracking in freezing temperatures. Now don’t get us wrong, there are plenty of colour-based fashion trends to try out this season. However, in a grey world, overly bright shades can be nauseatingly optimistic. To ensure you’re better-hued, look for deeper, richer versions of bright summer shades. Neutral tones such as grey, black and brown make getting dressed in the dark (a real possibility some mornings) a breeze. But that doesn’t mean you need to go monochrome (although it’s rarely a bad move). Alongside these, echo the changing leaves with rust rather than orange, moss green in the place of lime and mustard instead of sunshine yellow for an seasonally appropriate touch of colour that won’t look like you’ve just stepped off the beach. Accessorising against the elements means more than just buying a hat – though a wool baseball cap is far more stylish than a hood. Before you do anything, buy a decent, full-size umbrella. Bargain bin examples are a false economy. When they flip inside out, that’s a fiver wasted, and your suit ruined. Instead, look to specialist brands for something stronger and infinitely more sophisticated. Extend your waterproofing efforts to luggage too, by grabbing hold of a bag that won’t soak through in seconds. Coated leathers beat just about anything during the rainy season, or pick nylon and treated canvas for something thriftier and equally water-resistant. Helpfully, a bag is also a good place to stow the lightweight scarf you should also be buying when hopping onto public transport or into buildings to avoid overheating. There are plenty of pieces in the male wardrobe that are done excellently at lower price points. And remembering this for most other purchases should afford you a bit more money to splash out on a winter coat when the time comes. A premium piece won’t just last longer, but it’s also likely to perform better when the weather turns. A wool overcoat is the most versatile option. Look for well-cut examples in neutral colours like navy, grey or camel. 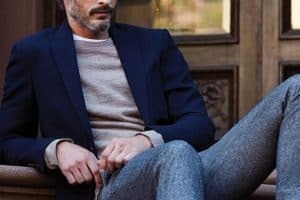 This style will slot seamlessly into your existing wardrobe, working just as well with tailoring as sweats; sending the cost-per-wear ratio through the roof. For a more dressed-down option, consider a waxed jacket or one of this season’s puffed-up parkas which, particularly when fitted with a hood, can stand up to anything mother nature throws your way. Next-level layering is one of the few things to love about bitterly cold conditions. Aside from the added ballast that comes with piling on multiple pieces, the greater number of combinations available means there’s less chance of running into your wardrobe twin. Though you may have a pretty good grasp of the basics (thinner pieces closest to the body etc. ), you’ll have to get experimental if you want to mark yourself out as a card-carrying member of club #menswear. 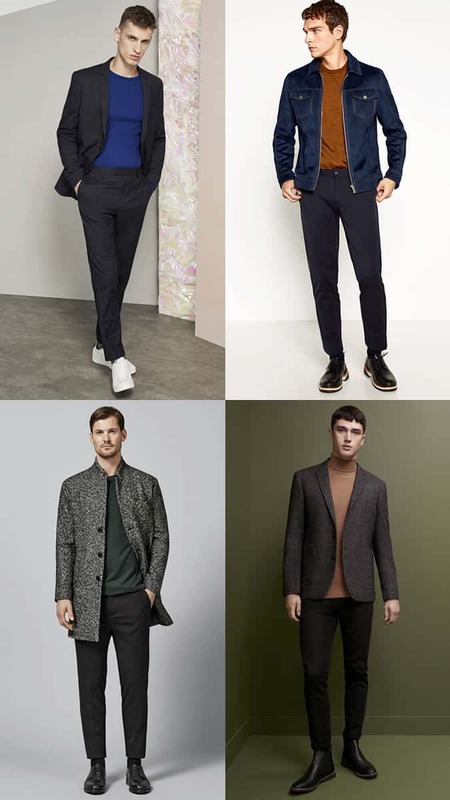 Try using classic pieces in unconventional ways, such as demoting your denim jacket to a mid-layer under an overcoat, or wearing a thick-gauge cardigan over a roll neck and shirt. Or play around with proportion by ‘reverse layering’ with a longline tee underneath a sweatshirt and cropped bomber jacket for a Kanye-approved way of tackling falling temperatures. Your layering game is a loss if you’re just bundling up in whatever fabrics are to hand. Getting the right material, in the right place, at the right time means you’re as comfortable in torrents as packed trains. As a general rule, pick breathable cotton or merino for items near your skin, working up to heavier wools next for warmth and then something weatherproof on top, be it century-old gabardine or a space-age polyamide. When it comes to shoes, look for easy-to-clean materials. Mud brushes off leather, but suede will stain at even the idea of drizzle. If ever in doubt (and you always should be where the weather is concerned), get yourself a forecast app. Forewarned is forearmed, after all. Wearing your favourite pair of trainers to death because no other shoe will do? We’re sometimes guilty of it too, but insubstantial footwear plus cold, wet weather is nothing but a recipe for frostbite, or trench foot, or both. So make sturdy boots your best friend when temperatures tumble. For off-duty days, along with hiking boots, a pair of worker boots are a no-brainer and are every bit as practical as they are stylish. Don’t forget to give them a regular once-over with the polish, though. One too many trips through the mud, and they’ll quickly go from statement-maker to scaffolder chic. If heading somewhere more formal or wearing a suit, smart leather lace-up or Chelsea boots are an excellent choice as they hit the sartorial sweet spot between form and function. The autumn/winter elements (both inside and out) make surprisingly light work of turning your hair and skin into scales, so you’ll need to arm yourself with a specific grooming arsenal to stay looking fresh. Firstly, stop squeezing the life out of the same tube of lightweight moisturiser you’ve had all summer, and replace it with a heavy duty version that doubles up as a night cream. To that, add a daily exfoliator to slough away dead skin cells that can clog your pores, and finally bolster your bathroom cabinet with a lip balm and hand cream to stop cracks in their tracks. When it comes to your hair, help your follicles fight the freeze by stocking up on treatments that work to keep moisture locked and flank these with a decent conditioner that also looks after the scalp to avoid flakiness.